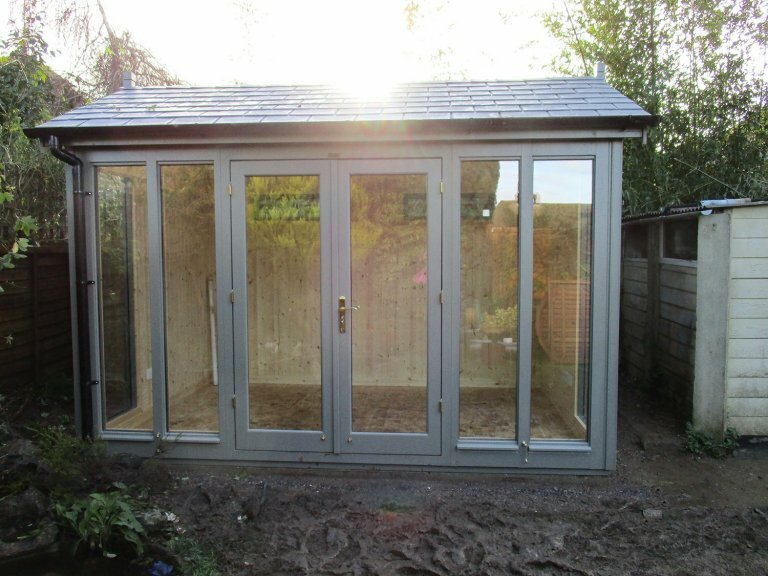 One of our modern Garden Studios was recently installed by our in-house fitting team for a customer based in Alton, Staffordshire. Selected by the customer from our range of FSC® certified Scandinavian Redwood timber Garden Studios, the building measures 2.4 x 3.6m and was assembled at the customers address by our in-house installations team. Internally, the building is lined and insulated with an electrical pack added to allow the use of lighting and appliances, meaning that the garden studio makes an ideal work from home office. It also boasts double-glazed floor-to-ceiling windows for added warmth and an abundance of natural light. 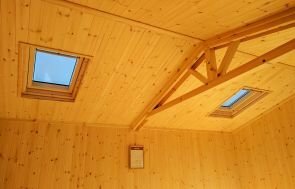 The interior is lined with natural pine lining and there are two opening fanlight windows along the rear length of the building, meaning that ventilation is possible during the warmer months. I wanted to express our complete satisfaction with the Burnham Studio and the installation provided by your team. Stuart and Martin did an excellent job and faced the challenge of getting everything up to the site positively and with good humour. Your electrician, Jack, was completely professional and wanted to ensure he met all our requirements. His young colleague Eric also helped carry the components up to the site. If you have prospective customers in this area who would like to see the studio, we would be very pleased to show them. Externally, the attractive building is clad with smooth shiplap cladding painted in the shade of Ash and grey slate composite tiles covering the apex roof. Our customer opted for polished chrome door furniture and also added black guttering to the fascia boards to protect it from the wetter weather. If you would like to view our Garden Studios for yourself, you can do so by visiting one of our UK show sites. Here, we have a selection of buildings on display and a team of friendly advisors on hand to assist with any queries you might have. Arrange your visit here or get in touch with us on 01760 444229.